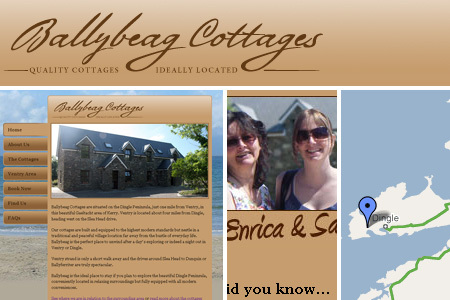 The owners of Ballybeag Cottages, a small holiday home company in Ventry, approached Waltzer Design to design their logo, website and a simple booking system. The new site allows the owners to easily update their site and take bookings over email, while users of the site can view photos of the houses and of Ventry, find their way using Google Maps and contact the manager directly to confirm bookings and availability. In terms of style I used Bolivar for the logo – it has a nice rustic feel to it while still being elegant, and the tag line is the serif font Garamond, which adds a bit of class and elevates it from Georgia or Times New Roman. Overall I’m very pleased with the results and it was a pleasure working on it. This entry was posted on Wednesday, July 8th, 2009 at 10:46 am	and is filed under New Work. You can follow any responses to this entry through the RSS 2.0 feed. Both comments and pings are currently closed.